Hi everyone! Pahlish has some gorgeous Fall colors coming out this Sunday September 10th at 7 PM CST! There are varying finishes and colors, so lets dive on into the pictures shall we? Let’s begin with the Orphan Black Duo! First up is Castor. This shade is described as an olive cream with red to green multichrome shimmer. It took two coats to reach full opacity. This shade is SO unique and pretty! Next up is Leda from the Orphan Black Duo! 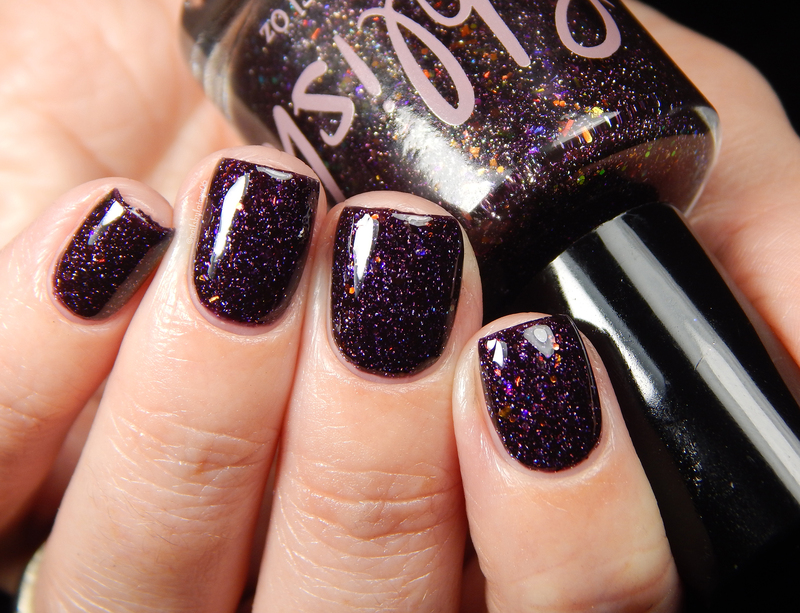 This shade is described as a sheer black with rose gold foil flakes and holographic flakes. This shade was opaque in 2 coats! Next is Pumpkin Carriage! This gorgeous orange is described as rusted pumpkin jelly with holographic flakes and copper sparks. It was opaque in 2 coats and is perfect for fall! I’m actually craving a pumpkin spice latte now lol! Next up is Hypnos. This shade is described as a lavender mauve cream with red to green multichrome shimmer. So so stunning! It only took 2 coats to reach opacity! 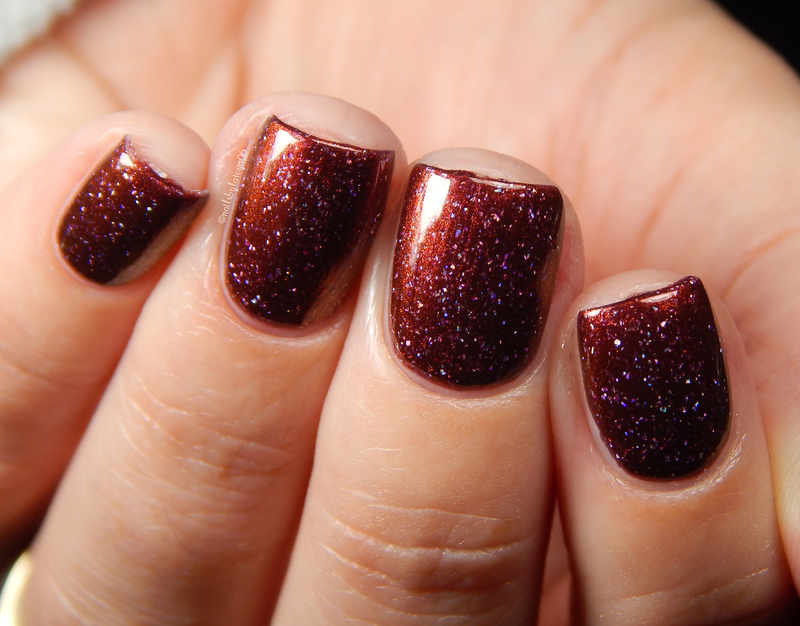 U-Pick is described as a deep blackberry jelly with holographic flakes, multichrome chameleon flakes, and orange chameleon glitters. I done two easy coats for this gorgeous shade!!! Wavelength is described as a bright ultramarine blue jelly with red shimmer and holographic flakes. This shade is seriously drop dead gorgeous!!! If you get any shades, get this one! It was opaque in 1 coat! And last but not least we have Equinox! 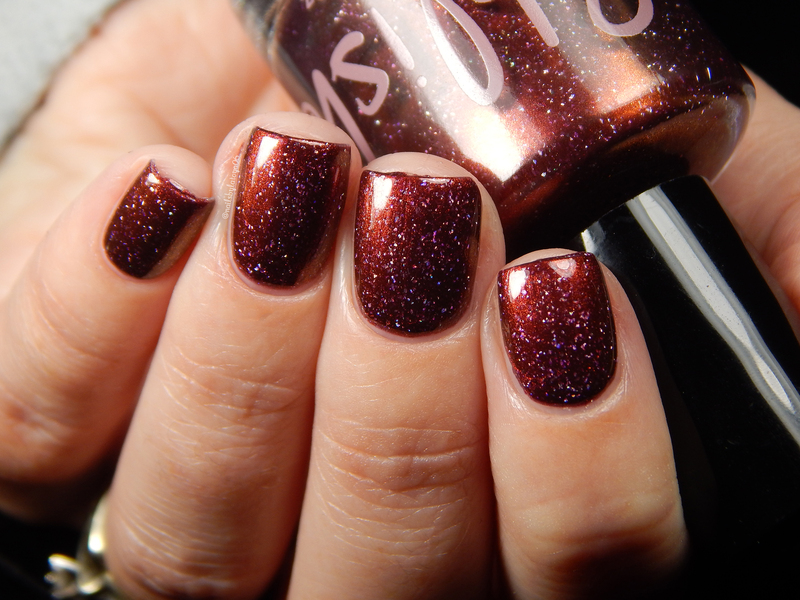 This shade is described as a sheer plum with red-gold multichrome shimmer and holographic flakes. I used two coats for this stunner polish! If you want to see them in action, check out my swatch video of them! There you have it!!! Which color was your favorite? Are you going to get any? Be sure to mark your calendar so you don’t miss the date! These will be available September 10th at 7 PM CST on Pahlish’s website! Don’t forget to like their Instagram and Facebook page! This entry was posted in Beauty, Nail polish Swatches and tagged beauty, Indie, makeup, Manicure, Swatch. Bookmark the permalink. ← Moroccan Tile inspired nail art featuring MoYou Explorer 03 stamping plate! These are gorgeous as usual! Pahlish can do no wrong.